MDC-Alliance presidential candidate Mr Nelson Chamisa yesterday threatened to usurp the powers of the Zimbabwe Electoral Commission and breach the Electoral Act by unilaterally announcing results of the July 30 harmonised elections. Further, Mr Chamisa said his party had Germany scientists whom they wanted to do “forensic testing of every ballot paper to be used in the election”. The alliance yesterday staged its second demonstration in Harare against ZEC, but dramatically trimmed its litany of demands from 10 to two, without giving any explanation. 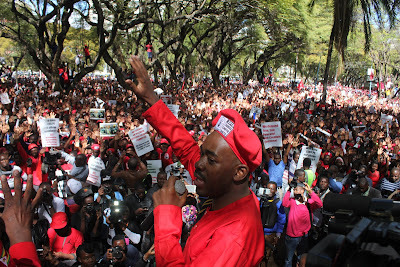 Addressing party supporters who gathered for the demonstration at Africa Unity Square, Mr Chamisa said he was ready to break the Electoral law by announcing the election results before ZEC. The Electoral Act indicates only ZEC has the mandate to announce election results through its chief elections officer within five days of polling. “We are going for elections and we have already won,” said Mr Chamisa. “After voting, we will converge at a place we will announce. We will announce the election (results) to you. We are going to tell you the election results because we do not trust ZEC to announce accurate results. It is us who are going to announce and we have set up the machinery in here and outside the country to tabulate the results,” he said. Mr Tendai Biti, then MDC-T secretary-general, was arrested in 2008 for announcing unofficial presidential results in which he claimed the late Mr Morgan Tsvangirai had won by 50,3 percent to obviate a run-off. Mr Tsvangirai resoundingly lost the run-off. Observers yesterday said it was shocking that Mr Chamisa, a lawyer, wanted to cause alarm and despondency in a country that had witnessed a peaceful pre-election environment. Mr Chamisa claimed Government had brought in Russians to assist Zanu-PF to win the polls, but his party would counter that using German scientists. Prior to that, Mr Chamisa — who conflated ZEC and Zanu-PF throughout his speech — had told his party supporters that the sovereignty of the country did not allow foreigners to interfere in the management of elections. “They (ZEC and Zanu-PF) want to change the ballot paper,” he said. “Right now they have Russians. I am being told by insiders and soldiers. I am watching them and if they are helping Zanu-PF on elections then we have an issue with that. Mr Chamisa said they had downscaled their demands against ZEC because the other eight were frivolous. “We had ten demands, but we have decided to shelve the other demands because they don’t matter,” he said. By reducing the demands, Presidential Press Secretary Mr George Charamba said, Mr Chamisa had “blinked”. “He has moved from infinity grievances against ZEC down to two,” he said. The MDC-Alliance continues with its demos despite ZEC having availed the voters’ roll to political parties and election stakeholders. Political parties have also been invited to observe the printing of ballot papers which is being done at Fidelity Printers. Mr Chamisa threatened to make Zimbabwe ungovernable if the alliance’s demands were not met. “We are now assessing the situation and after dialogue with ZEC this week, if there is no movement, we will not sleep,” he said.